SANTA MONICA, CA (November 5, 2014) – The San Francisco Giants captivated their city with their third World Series victory in five years as the 2014 World Series Champions! Fans can now take home a piece of the experience as the Official 2014 World Series Film arrives on Blu-ray and DVD November 25 from Major League Baseball Productions, A+E Networks Home Entertainment® and Lionsgate Home Entertainment, capturing all of the highlights and hand-wringing moments from the Fall Classic, including clutch performances by Madison Bumgarner, Hunter Pence, Pablo Sandoval, Buster Posey and the rest of the championship crew. For the ultimate die-hard Giants fan, the San Francisco Giants World Series Collector’s Edition arrives on Blu-ray and DVD December 2 boasting 8 full game broadcasts including all 7 games from the 2014 World Series and the pennant-clinching, NLCS Game 5 against the St. Louis Cardinals, including the walk-off home run by Travis Ishikawa. The Official 2014 World Series Film follows the Giants as they win every series in the 2014 Postseason, besting every team from perennial contenders to squads with some of the game’s best young superstars. They became the first team ever to win four rounds of Postseason play. And now they stand alone as World Series champions for the third time in five seasons. General Manager Brian Sabean filled a clubhouse with players whose character exceeded their amazing talent. But talented they were, riding “Mad Bum” to the championship while Pablo Sandoval and Hunter Pence hit everything in sight. As a result of the big moments from Manager Bruce Bochy’s cast of Travis Ishikawa, Michael Morse, Ryan Vogelsong, Brandon Belt, Brandon Crawford and Joe Panik, the San Francisco Giants are the 2014 World Series Champions. MLB Productions produced the film with exclusive access to players and coaches at the World Series Parade and at the ballpark, including indoor and on-field batting practice (both pre-game and during game), in-game wires, in the dugout and in the clubhouse post-game. The Official 2014 World Series Film provides a comprehensive Fall Classic storyline with bonus material that includes highlights, exclusive access and interviews, and breathtaking footage captured during the Postseason run of one of the longest-established professional baseball franchises in MLB history. An ideal holiday gift, the Official 2014 World Series Film Blu-ray and DVD will be available for the suggested retail price of $34.99 and $29.98, respectively. For even more memories, experience every inning, play and unforgettable moment of the 2014 World Series all over again in the San Francisco Giants 2014 World Series Collector’s Edition including all seven games of the Fall Classic™, as well as a bonus disc including the pennant-clincher – NLCS™ Game 5 – featuring Travis Ishikawa’s walk-off home run. From exciting veteran pitching to Pablo Sandoval and Hunter Pence’s relentless hitting, Manager Bruce Bochy’s San Francisco Giants played with an all-hands-on-deck attitude to endure a seven-game series against the Kansas City Royals. Steady pitching performances, flashy defense and a phenomenal relief outing by World Series MVP Madison Bumgarner clinched the Giants third World Series championship in five years. 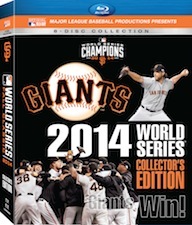 The San Francisco Giants 2014 World Series Collector’s Edition special features include four audio channels – TV broadcast, home and away radio and Spanish-language audio – and a full hour of bonus features with highlights and milestones from the 2014 Giantsseason and extended highlights of each Postseason win,. The Collector’s Edition will be available as an 8-disc set on stunning Blu-ray or DVD for the suggested retail price of $69.99 and $59.98, respectively. Title Copyright: ©/TM 2014 Major League Baseball Properties, Inc. Licensed for distribution by Major League Baseball Properties to A&E Television Networks, LLC. Major League Baseball trademarks and copyrights are proprietary to Major League Baseball entities. All Rights Reserved. Photos: Getty Images. Distributed by LIONSGATE® under license from A+E Networks Consumer Products™. Title Copyright: ©/TM 2014 Major League Baseball Properties, Inc. Licensed for distribution by Major League Baseball Properties to A&E Television Networks, LLC. Major League Baseball trademarks and copyrights are proprietary to Major League Baseball entities. All Rights Reserved. Photos: Getty Images. Marketed and distributed in the U.S. by Lionsgate® under license from A+E Networks Consumer Products.